(Another AV8RSTUFF Creation): This is one of the cruise patches for VFA-147 for their 2017 Deployment onboard the USS NIMITZ (CVN-68) as part of CVW-8. 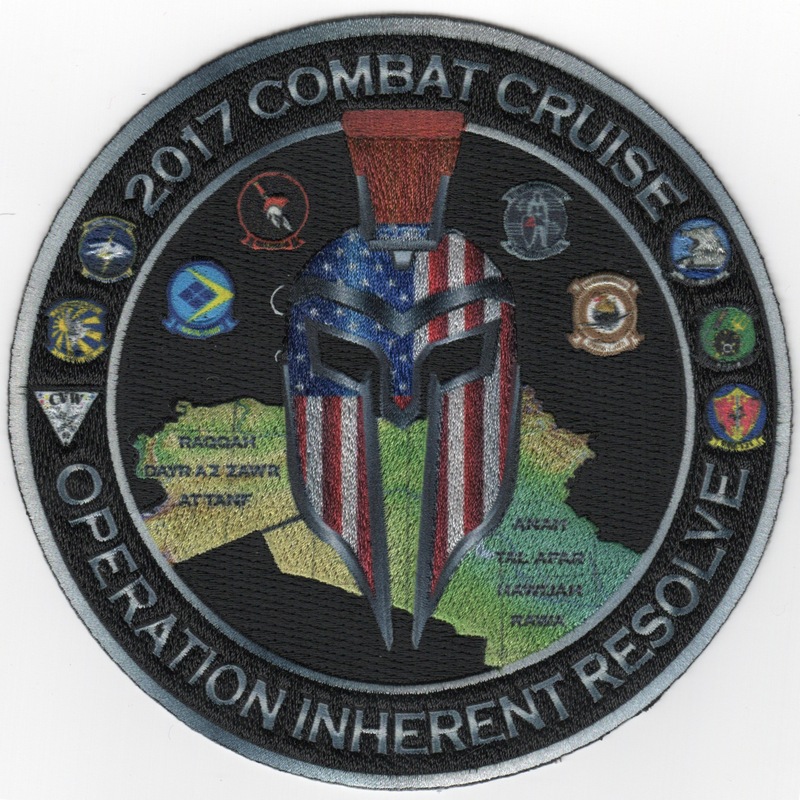 It says "2017 COMBAT CRUISE" (top)/ "OPERATION INHERENT RESOLVE" (bottom) with all the squadron logos around the edge of the patch. It has a Red/White/Blue Spartan Mask over the middle Eastern countries they "visited" and is made using that new "hybrid" technology, giving the most detail ever seen on a stitched patch. An absolutely amazing patch they commissionedQ!! This patch does not have velcro attached. (Another AV8RSTUFF Creation): This is one of the cruise patches for VFA-147 for their 2017 Deployment onboard the USS NIMITZ (CVN-68) as part of CVW-8. It has an "A and G" combined in the middle, says "IT'S OURS" on the upper left quadrant and "STAY THE F*CK OUT" in the lower right quadrant. 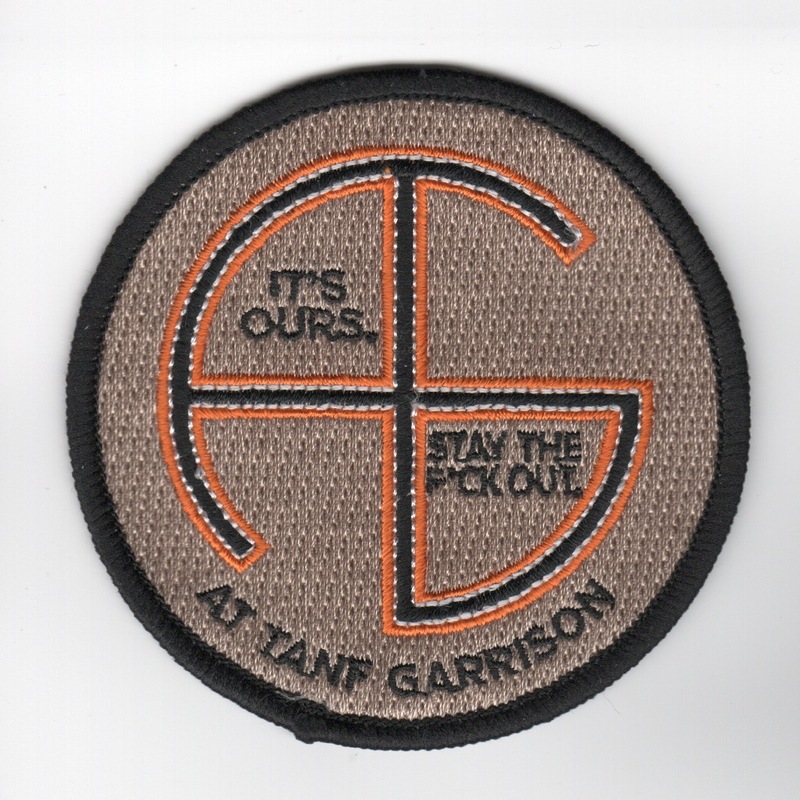 Along the bottom it says "AT TANF GARRISON", but don't have the full "back-story" on this patch (yet). This patch does not have velcro attached. This is one of the cruise patches for VFA-147 for their 2017 Deployment onboard the USS NIMITZ (CVN-68) as part of CVW-8. 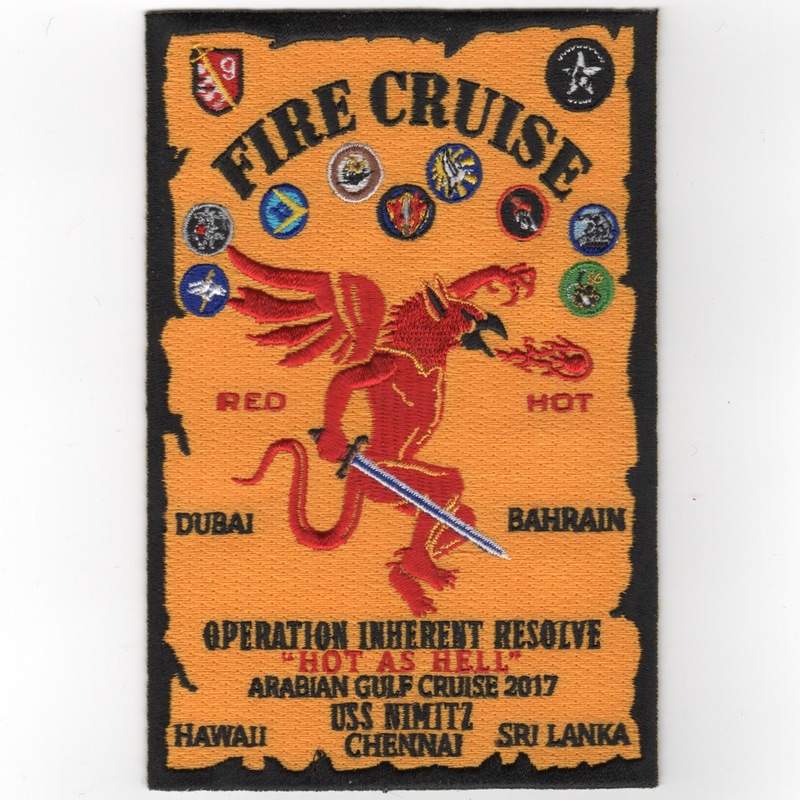 It says "FIRE CRUISE" (top)/ "OPERATION INHERENT RESOLVE" (bottom) with all the squadron logos along the top of the patch. It has a red "creature" breathing fire and says "HOT AS HELL". An absolutely amazing patch they commissioned and was only able to get a few of these!! This patch does not have velcro attached. 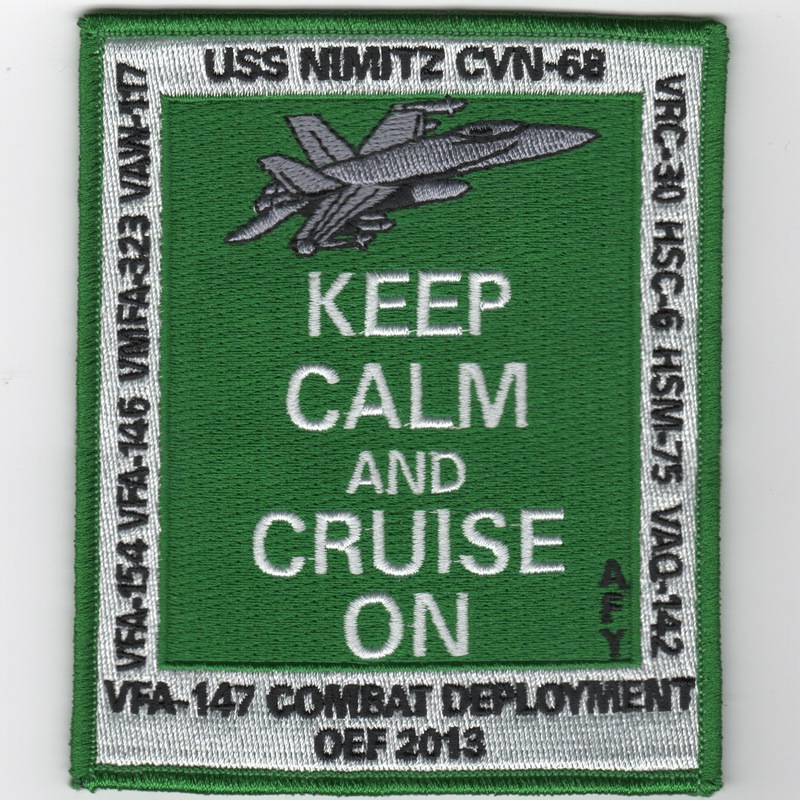 This is one of the cruise patches created for CVN-68 and VFA-147 for their 2013 OEF Deployment. It says "KEEP CALM and CRUISE ON", showing the F/A-18 across the top, listing all the squadrons along the sides. AV8RSTUFF purchased all the "old stock" from the squadron, so these are directly from them. ONE of them has velcro, so if you want it, drop a comment in the "COMMENTS" section and it's yours. First to ask for it, gets it. All else do not have velcro. This is one of the cruise patches we bought from the squadron that was created for CVN-76 and VFA-147 for their 2011 OEF Deployment. 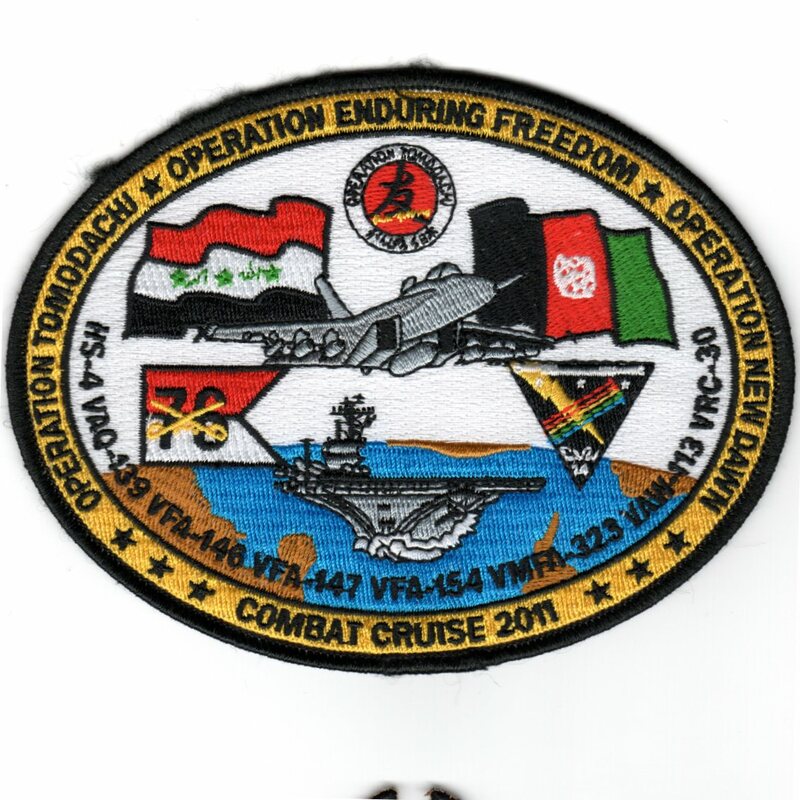 It says "OPERATION TOMODACHI * OPERATION ENDURING FREEDOM * OPERATION NEW DAWN" across the top of the oval, and says "COMBAT CRUISE 2011" along the bottom. It lists all the squadrons in Airwing 14 and shows the flags of the different countries. This patch does not come with velcro attached. 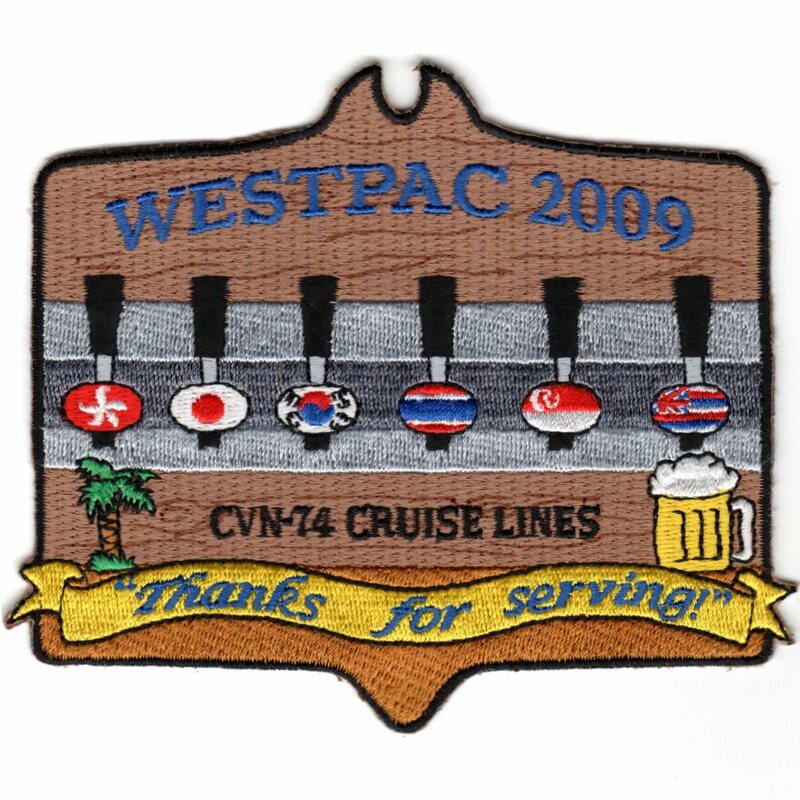 This is one of the cruise patches we bought from the squadron that was created for CVN-74 and VFA-147 for their 2009 WESTPAC Deployment. It says "CVN-74 CRUISE LINES - THANKS FOR SERVING". It shows a bar with beer taps that have all the flags of the countries they visited. This patch does not come with velcro attached. The "Argonauts" were established in February 1967, and have converted from the A-7 Corsair to the F/A-18C Hornet in the mid-80s. This is the yellow aircraft bullet from that squadron. They fly the Hornet with CVW-9 onboard the USS John C. Stennis (CVN-74). This is their commemmorative patch created when they did their 1992 "Flyover" at Super Bowl XXVII. It was dubbed "The Mother of All Flybys". The "Argonauts" of VA-147 were the first Fleet squadron to fly the A-7A Corsair II. They were established in February 1967, and have since converted to the F/A-18E Hornet in the mid-80s as VFA-147. 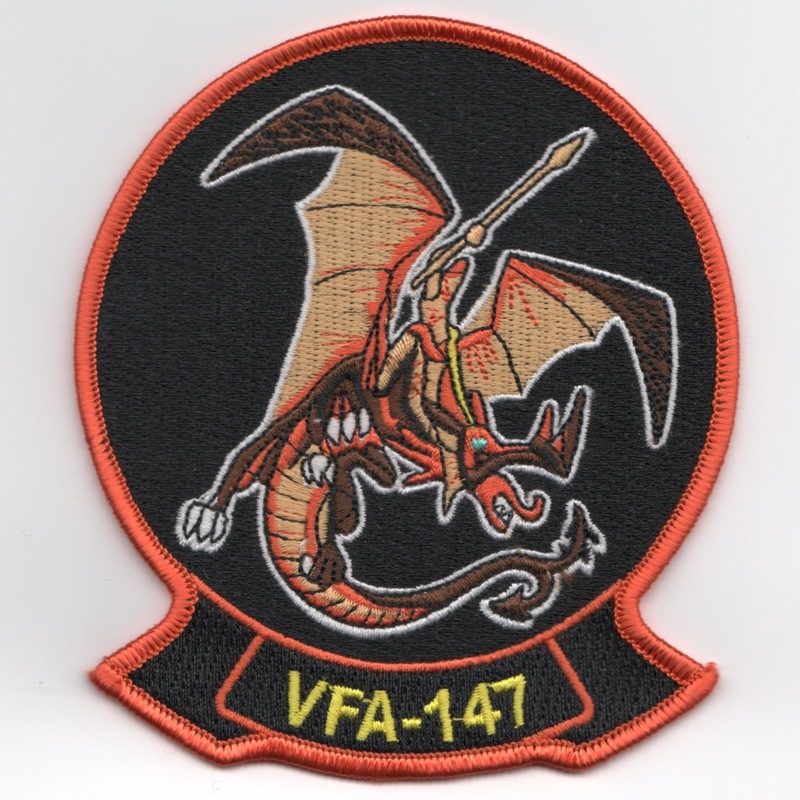 They currently fly the F/A-18E Hornet and this is the "Orange Man on the Orange Dragon" version of their squadron patch. This patch does not have velcro attached. The "Argonauts" of VA-147 were the first Fleet squadron to fly the A-7A Corsair II. They were established in February 1967, and have since converted to the F/A-18E Hornet in the mid-80s as VFA-147. 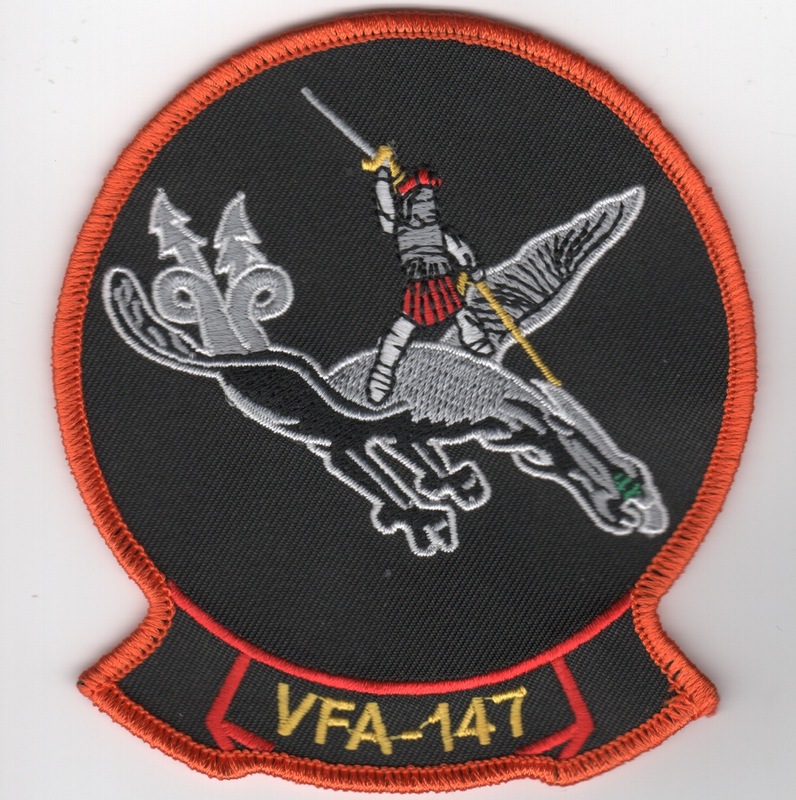 They currently fly the F/A-18E Hornet and this is the "Gray Man on the Gray Dragon" version of their squadron patch. The "Argonauts" of VA-147 were the first Fleet squadron to fly the A-7A Corsair II. They were established in February 1967, and have since converted to the F/A-18E Hornet in the mid-80s as VFA-147. This is the "heritage" patch from that squadron. They currently fly the F/A-18E Hornet. 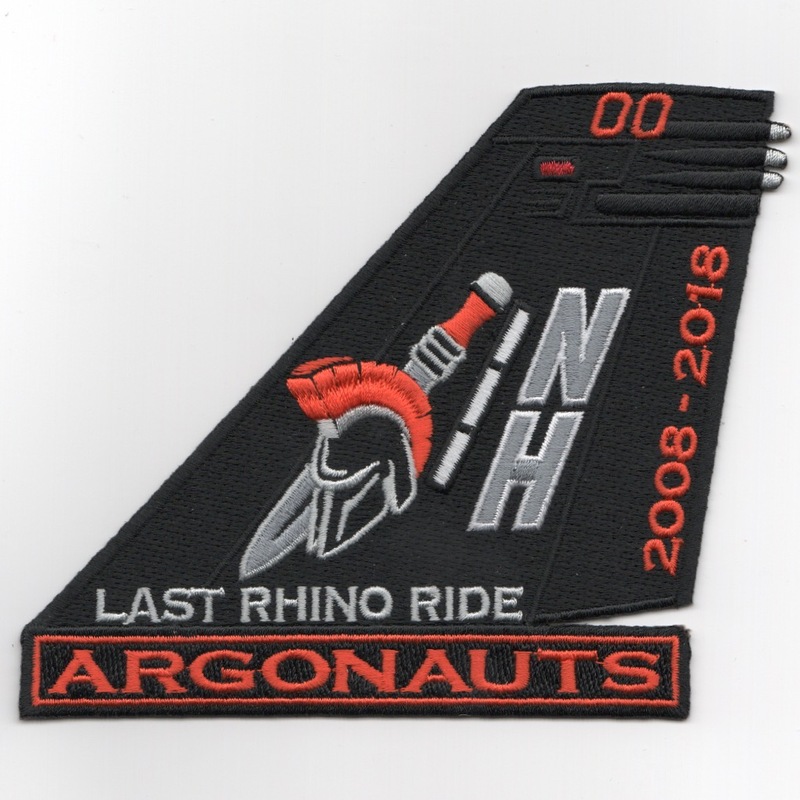 (Another AV8RSTUFF creation): This is the orange/black version of the F-35C aircraft diamond patch created for the 'ARGONAUTS' for their new platform they have just received (early 2018). This patch is absolutely beautifully stitched and does not come with velcro attached. The "Argonauts" were established in February 1967, and have converted from the A-7 Corsair to the F/A-18C Hornet in the mid-80s. 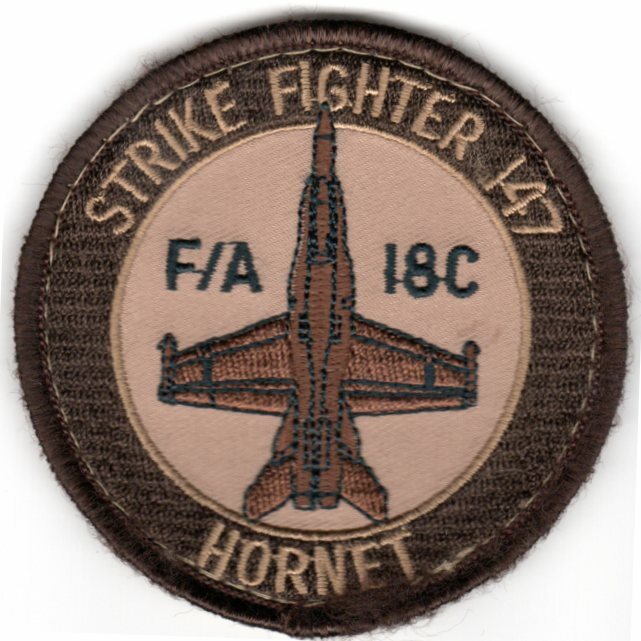 This is the black HORNET aircraft bullet for the F/A-18C from that squadron. 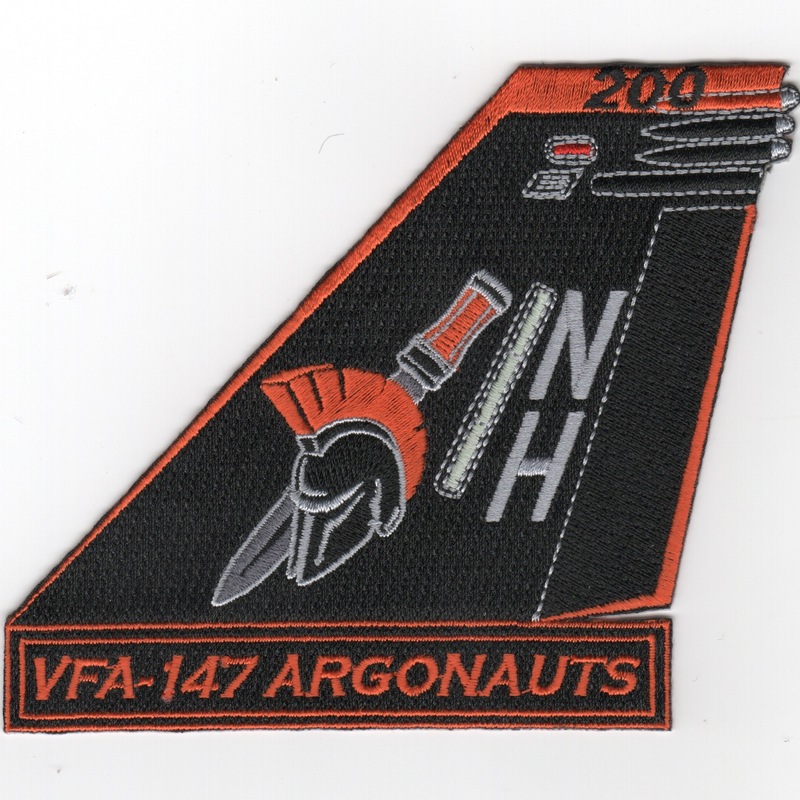 The "Argonauts" were established in February 1967, and have converted from the A-7 Corsair to the F/A-18E Hornet in the mid-80s, then to the F/A-18E Super-Hornet in the mid-2000s. 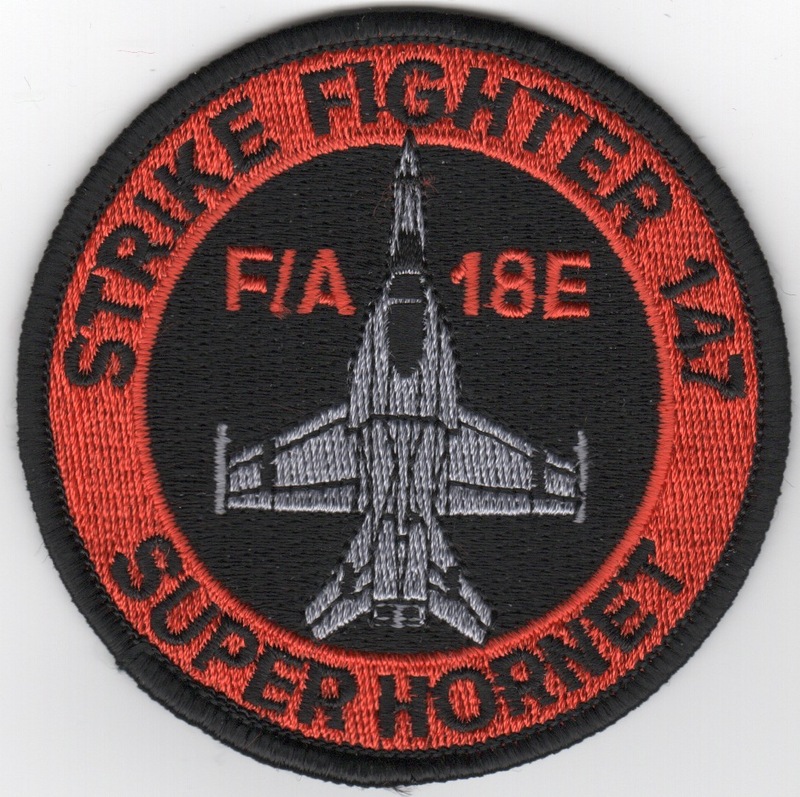 This is the black SUPER-HORNET aircraft bullet for the F/A-18E from that squadron. The "Argonauts" were established in February 1967, and have converted from the A-7 Corsair to the F/A-18C Hornet in the mid-80s. This is the yellow aircraft bullet from that squadron. They fly the Hornet with CVW-9 onboard the USS John C. Stennis (CVN-74). 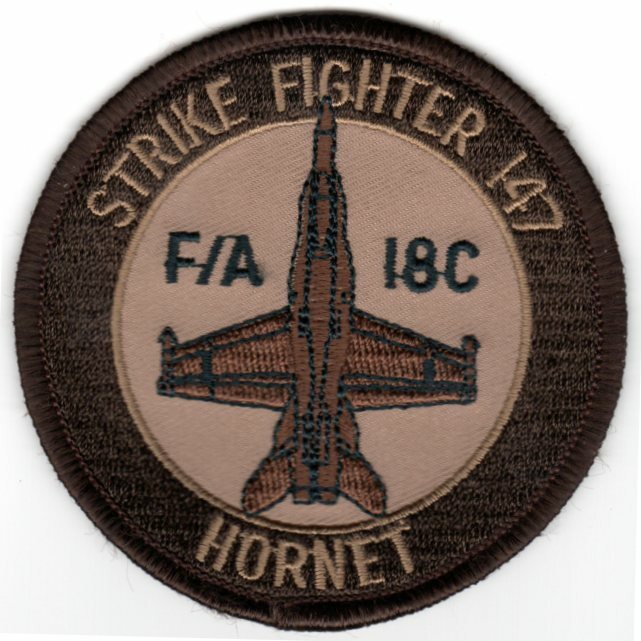 This is the desert version of the VFA-147 F/A-18C aircraft bullet patch. It is worn on the sleeve of the desert flight suit when in combat operations. This patch does not have velcro attached. 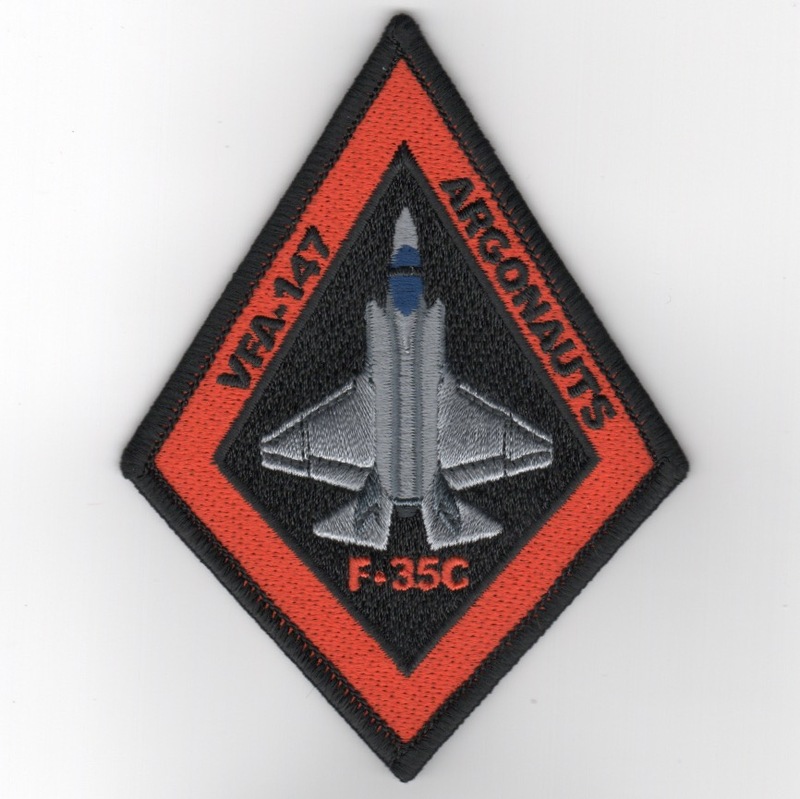 Homepage | Order VFA-147 Patches!